The character pictured here is often forced to forget, or rather, supress his sorrow, his problems, his inner feelings, in order to amuse his audiences, especially the children among them. His profession demands this of him; it is not a deception, however, but a praiseworthy sublimation of the self for the enjoyment of others, as well as his livelihood. 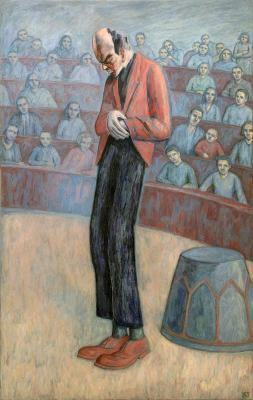 In this painting, it is as if for one moment the man hidden beneath the character of the clown (with his burden of emotion) has suddenly become visible.